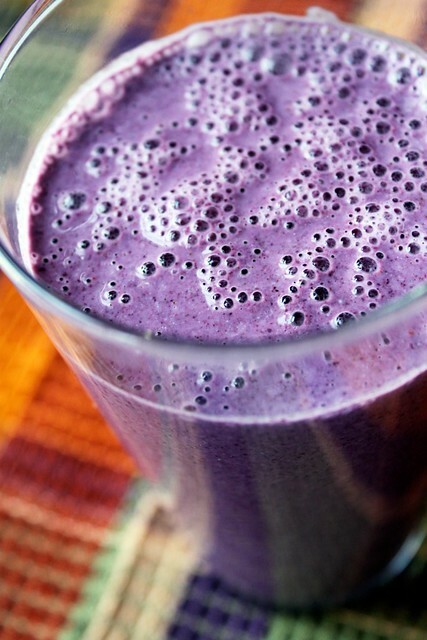 The secret to this smoothie's magical color is frozen blueberries. Whenever there is an abundance of natural color, there is usually an abundance of vitamins, minerals, antioxidants, and other great stuff. 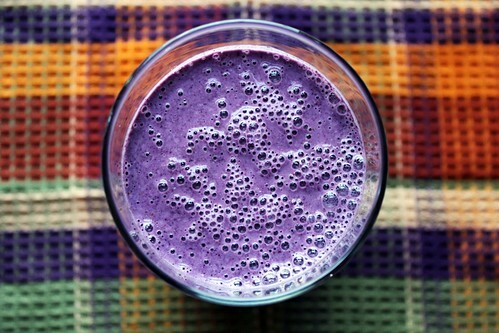 This smoothie is no exception, and I feel lucky to have access to such nutritional wealth! And to top it off, the opulent indigo hue makes me feel fancy, like I'm drinking some kind of beverage fit for royalty. In addition to the rich color, this smoothie boasts a wonderfully creamy texture, a result of blending the blueberries with soaked steel cut oatmeal and hemp seeds. Soaking does more than soften the oats for easier blending - it also breaks down the phytic acid and allows for easier digestion. Hemp seeds to not contain phytic acid, and are easily assimilate by the body and do not need to be soaked. Pretty cool, right? With each sweet sip, you are getting all sorts of things your body needs. It has a beneficial balance of complex carbohydrates, protein, and fat, and provides bioavailable nutrition that will keep you satisfied. I love this smoothie as a breakfast-on-the-go - as long as you do a little planning ahead the night before to soak your grains and nuts/seeds, it takes mere moments to prepare in a busy morning. It would also make a great recovery drink for after a good exercise routine. I'm including this recipe in February's SOS Kitchen Challenge, which features stevia. My co-host Ricki and I are encouraging our readers to use stevia in delicious, sugar-free recipes this month. Four lucky participants will receive a stevia prize from NuNaturals, our favorite brand of stevia. For full Challenge guidelines, please see this post, then check out the Linky below the recipe to enter your recipe in the round-up and be eligible for the giveaway! Good luck, and we can't wait to see what you make with stevia this month. This recipe is linked to Slightly Indulgent Tuesday at Simply Sugar & Gluten-Free, written by Amy Green. As a side note, Amy just released her new cookbook and it looks fantastic, so check it out! I use hemp seeds in this smoothie. Hemp seeds are high in protein, omega fatty acids, and amino acids, and have a nutty, warm flavor that I love. Unlike other nuts and seeds, they do not contain phytic acid, an antinutrient that can inhibit digestion. If you do not like, have or tolerate hemp seeds, feel free to use 2 Tbsp of any other nut or seed, and soak them with the oats to break down the phytic acid and allow for optimal digestion (and creamier blending). Place steel cut oats with 1 1/2 cups water and acidic medium in a bowl, cover lightly with a cloth, and let soak for 6-12 hours. Drain and very rinse well. Place soaked oats and all remaining ingredients in blender, and blend on high until smooth. Sweeten with stevia to taste. Serve immediately, or refrigerate until ready to serve.